When you upgrade from SharePoint Server 2013 to SharePoint Server 2016, you must use a database attach upgrade, which means that you upgrade only the content for your environment and not the configuration settings. Before you can upgrade the content, you must configure a new server or server farm by using SharePoint Server 2016. This article lists the items that you have to configure when you create that new environment. For an overview of the whole process, see Overview of the upgrade process to SharePoint Server 2016. Before you create the SharePoint Server 2016 farm, review the following information and take any recommended actions. Make sure that the hardware and software that you are using meets the requirements in Hardware and software requirements for SharePoint Server 2016. Make sure that you have appropriately planned your logical and physical architecture to support the features and functionality that you want in the SharePoint Server 2016 farm. Make sure that you have planned for sufficient performance and capacity for the SharePoint Server 2016 farm. The section explains how to configure service applications, except for the Business Data Connectivity service application which applies to SharePoint Server 2016. PowerPoint Broadcast Sites Office Online Server has changed into a separate server product which can serve multiple SharePoint farms for viewing and editing documents. Because of this change, PowerPoint Broadcast sites cannot be upgraded to SharePoint Server 2016. The Secure Store service application uses a passphrase to encrypt information. You have to know what this passphrase is so that you can use it in the new environment. Otherwise, you will not have access to the information in the Secure Store. If you do not know the passphrase, you can refresh the key, and then back up the Secure Store database. For more information, see Work with encryption keys in Configure the Secure Store Service in SharePoint 2013 . Run the Microsoft SharePoint Products Preparation Tool to install all required software. Run Setup to install the product. Install all language packs that you want in your environment. For more information about how to install available language packs, see Install or uninstall language packs for SharePoint Server 2016. Run the SharePoint Products Configuration Wizard to configure your server or servers. Some service applications can be upgraded by using a service application database upgrade. 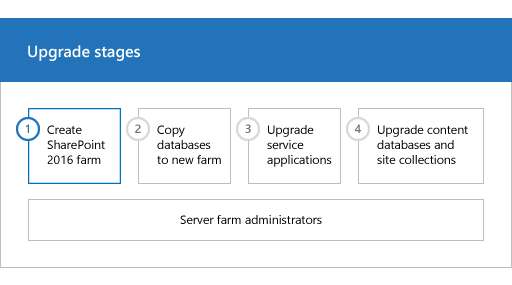 If you want to upgrade these service applications by upgrading the service application databases, do not use the Farm Configuration Wizard to configure these service applications when you set up your new farm. For step-by-step instructions for these tasks, see Install SharePoint Server 2016. You must create the service applications on your new farm before you upgrade your content databases. There are some service applications that can be upgraded from SharePoint Server 2013 to SharePoint Server 2016. The steps in Install SharePoint Server 2016 describe how to use the Farm Configuration Wizard to enable all service applications. However, you should not use the Farm Configuration Wizard to enable the service applications that you want to upgrade. For an overview of how to upgrade these service applications, see Services upgrade overview for SharePoint Server 2016. For the specific steps to upgrade these service application databases see Upgrade service applications to SharePoint Server 2016. If you had disabled the Workflow Auto Cleanup timer job in your SharePoint Server 2013 environment, make sure that you disable this timer job in your new environment also. If this timer job is enabled in the new environment and disabled in the SharePoint Server 2013 environment, you might lose workflow associations when you upgrade. . In a standard installation, the next step would be to create web applications. However, for upgrade, you create web applications later in the process, after you upgrade the service application databases. For more information, see Create web applications. This is the first phase in the process to upgrade SharePoint Server 2013 data and sites to SharePoint Server 2016.